Use every day during the training and competitive flying season. 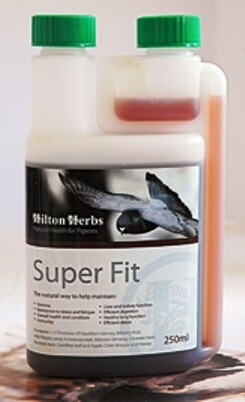 We recommend using Super Fit in combination with Re-Coop Plus and Biotic Pigeon for extremely fast recovery after a competitive or training flight. Tinctures of hawthorn berries, bilberry fruit, milk thistle seed, echinacea root, siberian ginseng, clevers herb, burdock root, comfrey leaf and apple cider vinegar and honey.